Few things are more coveted by trainers than a victory at The Festival at Cheltenham and no current handler has enjoyed more success than Nicky Henderson, who can boast 34 winners at Jump racing’s premier event including three successes last season. Indeed Henderson, whose first Festival victory came in 1985, is equal second on the all-time list alongside Martin Pipe. Only Fulke Walwyn, who sent out 40 winners over 40 years, has enjoyed more success. Paul Nicholls continues to rapidly gain victories at The Festival, having landed a record five wins last year to move him onto 25 wins in total. The champion trainer came agonisingly close to becoming the first trainer to ever to triumph in four championship races at the same Festival – winning the Seasons Holidays Queen Mother Champion Chase (Master Minded), the Ladbrokes World Hurdle (Big Buck’s), the totesport Cheltenham Gold Cup (Kauto Star) and sending out Celestial Halo to finish a neck second in the Smurfit Kappa Champion Hurdle. Ireland’s most successful current trainer is Edward O’Grady with 18 victories, although Willie Mullins is catching up fast after saddling three winners last year to move him onto 15 successes. Local trainer Jonjo O’Neill is on 16 winners, while Philip Hobbs and Alan King have both enjoyed 11 successes apiece, one more than Nigel Twiston-Davies. For the fourth consecutive year, Paul Nicholls was leading trainer at The Festival in 2009. He sent out an unprecedented five winners over the four days, including victories in the Seasons Holidays Queen Mother Champion Chase (Master Minded), the Ladbrokes World Hurdle (Big Buck’s) and the totesport Cheltenham Gold Cup (Kauto Star). All three horses are the current ante-post favourites to regain their crowns this year and the champion trainer is almost guaranteed to be a short-priced favourite to take the Thomas Pink Leading Trainer Award once again. There were three seconds as well, notably Celestial Halo who was beaten a neck in the Smurfit Kappa Champion Hurdle and Denman who chased home stable companion Kauto Star in the totesport Cheltenham Gold Cup. Nicholls, if he wins the 2010 totesport Cheltenham Gold Cup, will become the joint most successful trainer alongside Tom Dreaper in the great race. His chief rival could again be Nicky Henderson, who moved up to equal second on the all-time list for Festival winners courtesy of three victories headed by the success of Punjabi in the Smurfit Kappa Champion Hurdle. The master of Seven Barrows looks set to have another strong hand in the race this term as well as elsewhere during The Festival because of a raft of novice chase talent including the likes of Punchestowns, Long Run and Riverside Theatre. Henderson now has four successes in the Smurfit Kappa Champion Hurdle and if he achieves victory in the hurdling championship this year he will join Peter Easterby as the race’s leading trainer. Alan King, Philip Hobbs, Jonjo O’Neill, David Pipe and Paul Nicholls are among those to be respected and will be fighting to the finish of The Festival 2010 to collect the Thomas Pink Leading Trainer Award, while the challenge from Ireland is always strong and Willie Mullins will have a chance to become the first trainer based in Ireland to win the award since 1996. 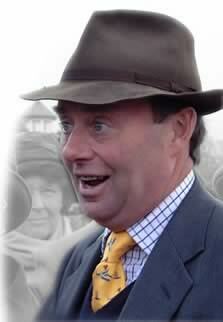 The Thomas Award Leading Trainer Award will be decided on the number of winners trained over the four days. If there is a tie, it will go down to the number of second places. If there is still a tie, the number of third places will be taken into account and the award will be shared if there remains a tie after that.